When we came back home from the farm with over 10 kg of cranberries, I was excited to experiment with recipes and ideas, using a berry that I had never really cooked with before. 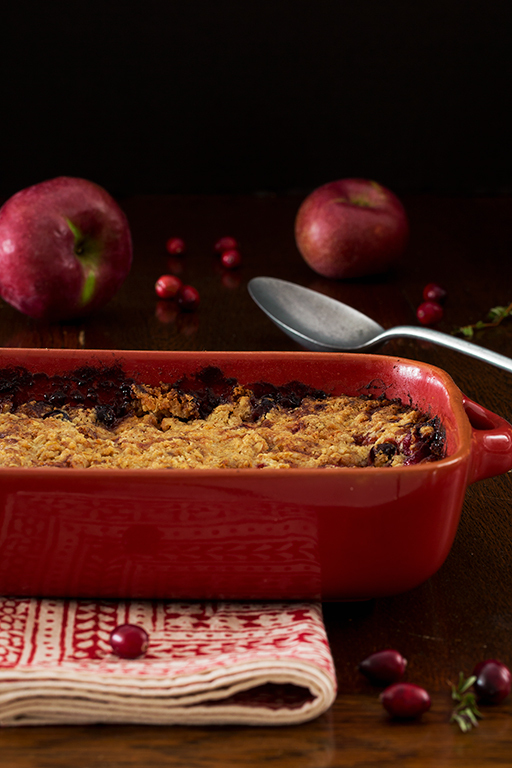 Making crumble and pairing apples with cranberries seemed easy and obvious; both fruits were local and in season, moreover the tart cranberries complemented the sweetness of apples. It is an easy-to-make dish which can be prepared at the last minute and does not require much time in the kitchen. I often bake my crumbles while we are having dinner and bring them hot to the table to eat with a scoop of ice cream. Cut 300 g of softened butter into 1 inch cubes or smaller. To make the crumble using your hands: place the flour, oats and sugar in a deep bowl and lightly rub the butter into the dry ingredients with the tip of your fingers until they combine and become like rough sand. Do not over work or the mixture will become heavy. Spread the crumble over the fruits making sure to cover them completely. I find it quick and easy to make the crumble by hand, but if you prefer, you can chose to pulse them in a food processor. Place sugar, butter and flour in the bowl, and pulse a few times until you get a crumble; combine the oats with one last pulse. Do not over do mix, the crumble should remain fairly dry and separated. Spread over the fruits covering them completely. Dot the surface with the remaining 25 g of butter and bake in the centre of the hot oven for 35 minutes. Serve warm with vanilla ice cream.